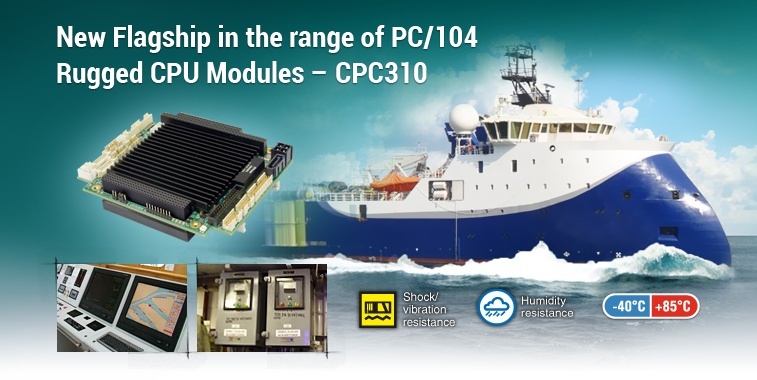 Range of Fastwel PC/104-Plus modules was expended with CPC310 - Intel Atom Bay Trail multicore based SBC designed for marine applications. CPC310 is suggested to be used in building real-time onboard high-speed data acquisition systems. The module has a standard PC/104-Plus implementation and is developed in consideration of the future replacement for CPC304, providing the easiest possible transition to the new device for our customers. CPC310 is based on the industrial version of Intel Atom Bay Trail multicore CPU with 64-bit architecture. The used Intel Bay Trail CPU platform offers exceptionally low power consumption: up to 10W, capability of operation in the industrial temperature range (-40 …+85ºC) and support of memory with ECC. As to the Atom platforms of previous generations, this one is distinguished by a new x86 core with improved performance and a high-performance graphics controller. The module is equipped with a wide range of interfaces for connection of peripheral equipment: 2x Ethernet channels, 4x USB ports, one Serial ATA port, 4x serial (RS232, RS422/485) ports and one LPT parallel port, 8x separately programmed digital I/O lines, PS/2 keyboard and mouse port, connector for CFast drives. Module’s functionalities can be extended through the connection of auxiliary modules of PC/104, PC/104-Plus, PCI-104 formats. The integrated video controller with 3D/2D acceleration enables direct operation with a standard analog monitor connected via VGA on the board, as well as with digital TFT panels using LVDS connectors. All the CPC310 components are soldered onboard, which provides the device with high durability and resistance to impact and vibration loads. Conformal coating option is available upon request. The module supports the most common operating systems: Linux 3.8, Microsoft Windows Embedded Standard 7/8 and QNX 6.х.